Those reels run blazing hot! This game has taken quite a few casinos by storm when it got released! Ultra Hot™ is finally playable on Slotpark – in all its deluxe glory! If you have fruit symbols on every position on the reels, you’ll get a whopping 2x multiplier for your win! Looking for that slot machine ablaze with Vegas flair? This game will not try to distract you with mini games and dozens of win lines, trying to make you risk your hard-earned winnings with risky extra bets. Ultra Hot™ deluxe is all about pure, unadulterated slot fun, all about chasing the next big jackpot! Ultra Hot™ deluxe keeps it old school through and through. Three reels (only 3, where do you find old school slots nowadays?) and only five win lines are all this slot need to keep you playing, and all you need to arrange your favorite win symbols on. Make no mistake, it’s simplicity does not equal low payouts, Ultra Hot™ deluxe will shower you in jackpots just like the rest of our portfolio on Slotpark. All win combinations require three symbols of a kind to appear along any currently active win line. The first tier is the black X symbols, with a relatively low payout multiplier. Next are the fruit symbols, all classic motives from the past, with oranges, lemons, plums and cherries all bringing the same amount of winnings. Their multiplier is about eight times higher compared to the multiplier of the X symbols. 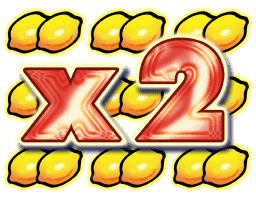 Keep in mind that you need the same type of fruit to appear in a row for the multiplier to trigger! Additionally to high jackpots triggered by the higher tiered win symbols in this slot game, there is also the chance to gain the double the payout for all active win lines during a given round. All you need to do for this occur is to get all fields on all reels filled with the same fruit symbols. A screen filled with cherries for example will not just be pleasant to the eye, they will also boost your bank considerably! The gamble features, well known and considered a core mechanic for many Novomatic slots, is of course also present in Ultra Hot™ deluxe. Four cards of a previously shuffled deck will be shown, players may guess which color the next uncovered card may be. If they succeed, they instantly doubled their winnings this round, but if they guessed wrong, they instantly lose everything! The bright BAR symbols are the next tier of payout multipliers, with a slightly higher multiplier than the previously named fruits. For our newly opened social casino our highest priority was simple, and yet so hard to fulfill: only slots of the highest quality should make it into our portfolio. Partnering with Novomatic, a developer known for many hit games and with years of experience in the field, was an obvious choice. Just as obvious as offering all these slots to our players for free. We are aiming to provide one of the biggest communities for casino gaming, attracting both new players as well as veterans. Providing easy access and allowing players to pick from a huge variety of slot machines seems almost a prerequisite at this stage. We don’t take the responsibility lightly. All the slots you see on Slotpark have been updated to work on all modern platforms, browsers and device. No matter if it’s your desktop, your mobile or your tablet, anywhere you might be, Slotpark lets you play the best Vegas slots anywhere, completely for free! Slotpark is a free online game of chance for entertainment purposes only. You cannot win real money or real items/services by playing our slot machines. The virtual currency used in this game is called ‘Slotpark Dollars’ and can be purchased in the ‘Shop’ using real money. ‘Slotpark Dollars’ cannot be exchanged for cash or be paid out in any form. They can only be used to play this game. The games are intended for an adult audience.